We'll spend the next few days looking at bridges in the Seattle Area. 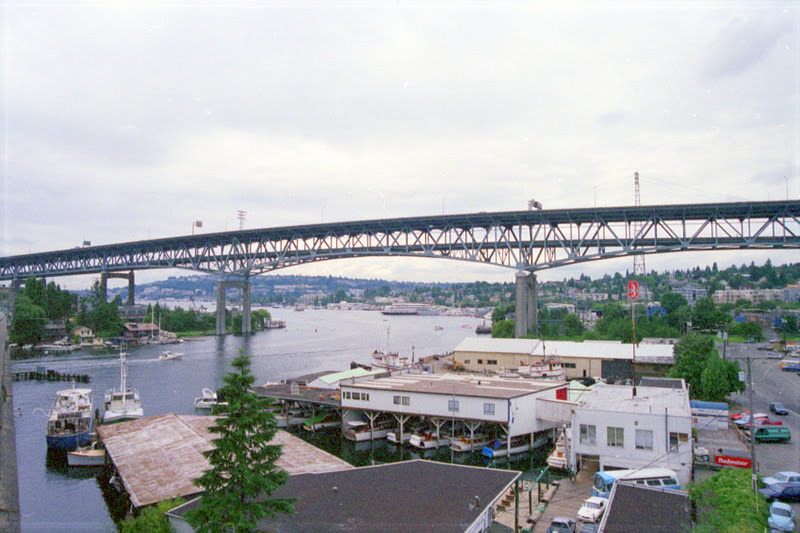 The Ship Canal Bridge carries I-5 over Portage Bay in northern Seattle. It was completed in 1961, a year before the opening of I-5. It is a 4429 ft long bridge that includes a six span (2294 ft long) double deck truss structure over the water. The top deck is 82 ft wide and carries eight lanes of two-way traffic. The bottom deck has four lanes that carry southbound traffic in the morning and northbound traffic in the afternoon. At almost 200' tall, it is a very impresive structure. Washington State Bridges: Ship Canal Bridge by Mark Yashinsky is licensed under a Creative Commons Attribution-Noncommercial-No Derivative Works 3.0 United States License.